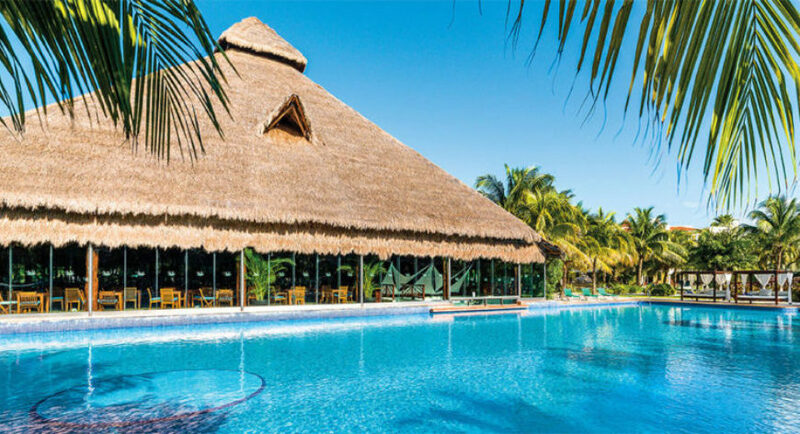 El Dorado Royale a Spa Resort by Karisma has been recognized as the only Gourmet Inclusive In North America to receive the prestigious AAA Four Diamond Award since 2007. 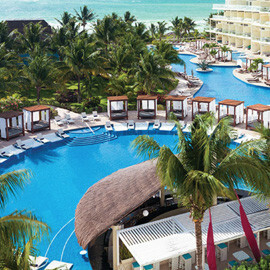 Voted one of Conde Nast traveler´s Top 100 Hotels in the world, El Dorado Royale, a Spa Resort, by Karisma is Mexico´s premier adults-only, beachfront resort where couples, wedding parties and honeymooners savor a Gourmet Inclusive experience, a vacation that fosters togetherness. 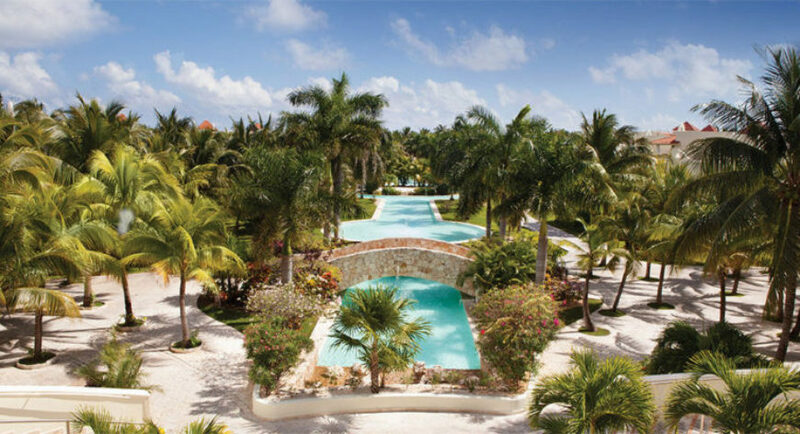 Luxuriously romantic, stretching on a secluded beach, the resort provides indulgences from gourmet cuisine, luxury swim-up suites, to a lush health club and personalize concierge service. 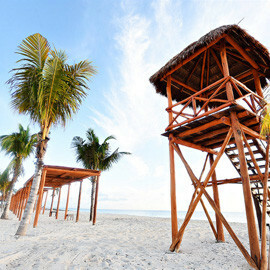 Situated in the center of the Riviera Maya, facing the beautiful Mexican Caribbean. 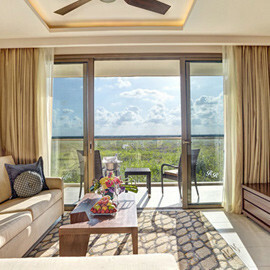 25 minutes south of Cancun International Airport, 15 minutes north of Playa del Carmen, only 10 minutes out from “Mayakoba championship” golf course, 25 minutes away from the “Playacar Golf Club” and 5 minutes south from Puerto Morelos and 35 minutes south of downtown Cancun. 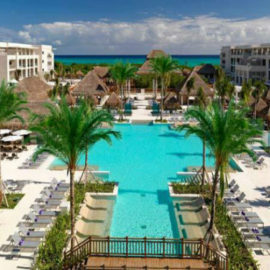 The resort is only 25 minutes south of Cancun International Airport, 15 minutes north of Playa del Carmen, and approximately 30 minutes from world-class golf, stunning natural cenotes and downtown Cancun. 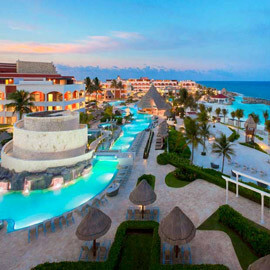 The El Dorado Royale, A Spa Resort features 478 luxuriously decorated Suites in 11 categories. All accommodations are provided with: indoor Jacuzzi, air conditioning, ceiling fan, night table, radio/alarm clock, bathrobes, safety deposit box, private bath, hair dryer, cable TV, amenity kit, terrace with a table and 2 chairs, hammocks (upon request), daily stocked minibar with beer, water, soft drinks, iron & ironing board and coffee maker. 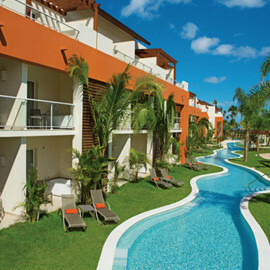 All suites have lavish garden views and are decorated with inspirational Mexican culture. 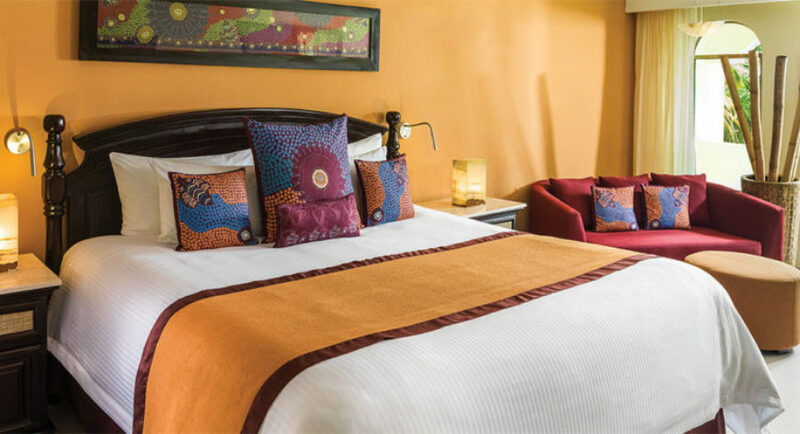 Featuring, authentic dark wood furniture with king or double bed, each suite has an indoor luxury Jacuzzi, terrace or balcony and contemporary bathrooms equipped with double sinks and our signature amenities, creating an overall relaxing and romantic atmosphere. 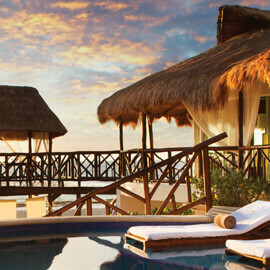 These newly renovated suites surrounded by lavish garden views, are decorated with inspirational Mexican culture. Featuring authentic dark wood furniture with king or double bed, each suite has contemporary bathrooms equipped with luxury Jacuzzi, double sinks and our signature amenities, creating an overall relaxing and romantic atmosphere. With only a few steps away from our white sand and breathtaking beach, all the suites are decorated with inspirational Mexican culture. Featuring, authentic dark wood furniture and king bed, each suite has contemporary bathrooms equipped with luxury Jacuzzi, double sinks and our signature amenities, creating an overall relaxing and romantic atmosphere. With a convenient direct access to a semi-private pool from your terrace, these suites are decorated with inspirational Mexican culture. Featuring authentic dark wood furniture with king bed, each suite has contemporary bathrooms equipped with luxury Jacuzzi, double sinks and our signature amenities, creating an overall relaxing and romantic atmosphere. 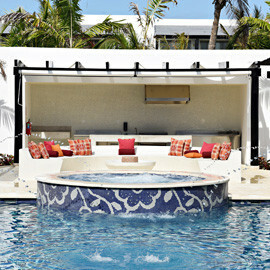 These newly renovated suites, are decorated with inspirational Mexican culture. Featuring authentic dark wood furniture with king bed, each suite has contemporary bathrooms equipped with luxury Jacuzzi, double sinks and our signature amenities, creating an overall relaxing and romantic atmosphere. Location: Premium Section of the Resort. Room carefully decorated, updated and designed to relax and enjoy, with DVD-player, connoisseur cabinet with four different selected spirits to delight, upgraded minibar. Welcome amenities (fruit basket, bottle of champagne and house wine), daily turn down service Butler/concierge service available supporting guest needs, aromatherapy and pillow menu to choose, dinner reservations, movie selection menu, in suite complimentary internet access. 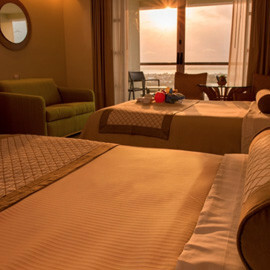 All rooms feature lovely wooden furniture including king size bed only. 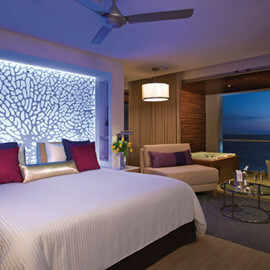 Within the hotel facilities: Vonage internet phone, E-lounge and beach candle light dinner once during their stay. With a convenient direct access to a semi-private pool from your terrace, these suites are decorated with inspirational Mexican culture. Featuring authentic dark wood furniture with king bed, each suite has contemporary bathrooms equipped with luxury Jacuzzi, double sinks and our signature amenities, creating an overall relaxing and romantic atmosphere. Included is a connoisseur cabinet with a variety of premium spirits, upgraded minibar, premium welcome amenities and complimentary internet access. Enjoy your private e-lounge and Butler/concierge service offering a wide array of services including personal dinner reservations, a selection of sports activities and an individual butler phone. 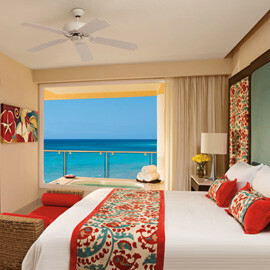 Step inside our oceanfront Presidential Suite, decorated with inspirational Mexican culture. Featuring authentic dark wood furniture, a master bedroom with a king bed, and a second bedroom with two double. 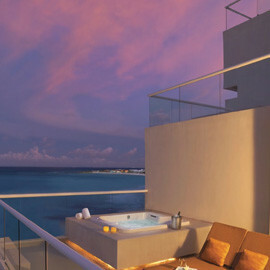 Each suite has an indoor and outdoor luxury Jacuzzi. Enjoy contemporary bathrooms with double sinks and glass enclosed showers creating an overall relaxing and romantic atmosphere. Enjoy your own living room with high tech features, dining room, private swimming pool, and outdoor hammocks. Included are lavish amenities, products by L'Occitane, Wireless internet access, and premium bar and snacks. 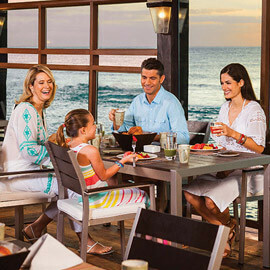 At Cocotal guests appetites are met with enjoyable tastes from all over the world served a la carte. With a great chef´s menu, Cocotal offers something for everyone in an elegant air conditioned atmosphere. A la Carte Gourmet Dinner: 5:30pm–10:00pm. This beautiful and romantic Italian restaurant leaves many guests craving for more. A la Carte Dinner: 5:00pm – 10.00pm. 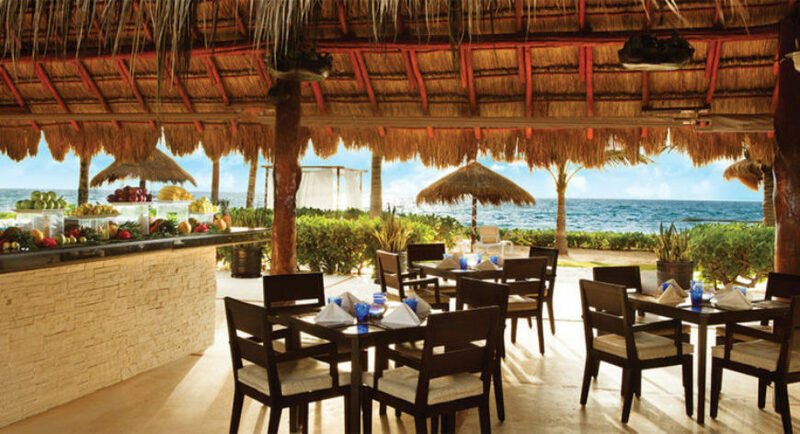 Open air palapa serving a la carte International Cuisine with a special focus on Mediterranean cuisine at dinner. At Jojo’s the guest will be able to enjoy the fresh Seafood Gourmet dishes with a spectacular view of the Caribbean in a casual ambience from 11.00am -6.00pm for lunch. 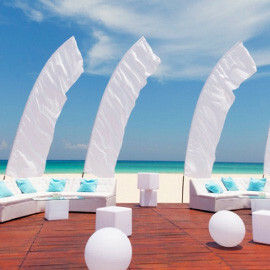 The perfect place at night to delight yourself with the ocean breeze while savoring dinner 6.00pm-10.00pm. 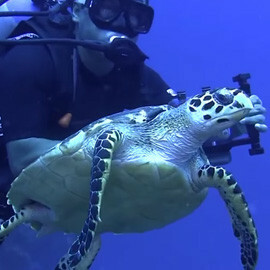 Only one daily sitting* starting with a welcome cocktail at 7:00pm, followed by the dinner & show at 7:30pm. *Reservations are required. Closed on Sundays. 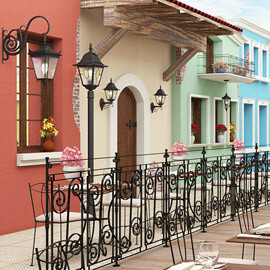 Welcome to the real Mexico, the perfect place to experience during lunch time the authentic Mexican “street food” while you enjoy our relaxed ambiance with stunning garden views. 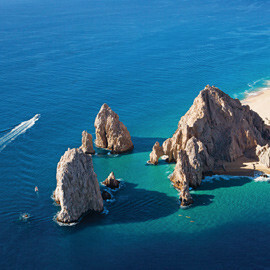 During dinner, delight your senses with our exclusive “Mexican author’s Cuisine” in a pleasant and casual atmosphere. Kampai not only has its own sushi menu, but also is creatively decorated with Buddha statues and other eye-catching oriental designs. Authentic Italian Cuisine in a Luxury Beachfront setting that offers traditional dishes, along with creations from our International Chefs. In the midst of décor reminiscent of the old New Mexico missions, Santa Fe Grill is an innovative proposal catering unique flavors on coal oven-cooked dishes and presentations ideal for sharing. It is, no doubt, a memorable experience of our guest, recommended to enjoy at sunset, due to its spectacular view of the sun setting over the surrounding mangrove. All Restaurants operate on select schedules A maximum of 6 people per table is allowed; for groups with more than 6 people, restrictions may apply. To enhance our unique dining experience, please comply with the following casual elegant dress code in all gourmet restaurants. Ladies: Capri pants, Dresses, Skirts, Long Pants, Shoes, Dress Sandals. Gentlemen: Formal Bermuda shorts, Long Pants, Collared shirts, Casual shoes or dress sandals. HEALTH BAR: Open from 8:00am – 4:00pm. Serving fresh fruit, juices, whole wheat sandwiches and smoothies. Sip Martinis at the sophisticated-chic Martini Bar which offers a variety of premium vodkas from around the world. Serving premium brands beverage selection. Relax on one of the swinging chairs while savoring a cold drink. 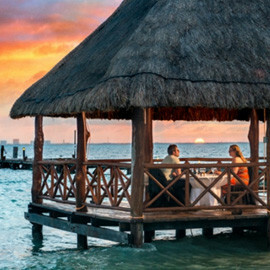 Choose between a great variety of beverages (cold Mexican beers, cheladas, exotic cocktails or aged tequila) with live music. Swim up bar located at La Isla Swimming Pool. 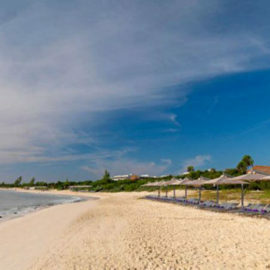 Located on the beach with spectacular views of the ocean. 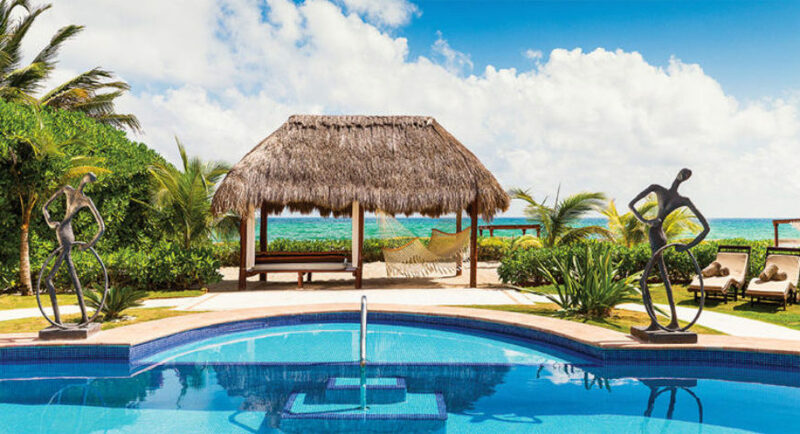 The 20,000 square feet Mexican-themed Naay Spa welcomes both, El Dorado Royale guests and El Dorado Casitas Royale guests, to experience an impressive menu with traditional and alternative spa therapies. Designed to soothe the senses, the luxurious spa facility includes a water journey pool, sauna, steam room, showers, spa treatment rooms, fitness center, boutique spa shop, bridal suites, event space and full-service salon. 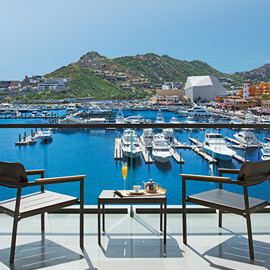 The new Casitas Spa incorporates elements of the Gourmet Inclusive philosophy with its unique services and alternative therapies inspired by native Mexico introducing Temazcal rituals. The Delicious Chocolate therapy invites guests to experience chocolate with no remorse. This sensual treatment is rich in minerals and smooth, nourishing cocoa butter. In addition to these spa treatments, Casitas Spa offers more traditional favorites such as scrubs, body wraps, special treatments, facials, manicures, pedicures and full-service beauty salon services.